The MarkStar™ is a handheld Fiber Laser Marking System designed for true portability into the field or warehouse operating off both AC/DC power sources. For oversized applications, the MarkStar is the laser marking system of choice. Laser Photonics MarkStar is an industrial-grade system designed to operate under continuous high-vibration, shock, and dust conditions and is Windows 10 compatible. All Direct Parts Marking (DPM), including UDI/UID barcodes, logos, and all other service marks are permanent, legible and non-removable with special attention to highly-reflective metals. 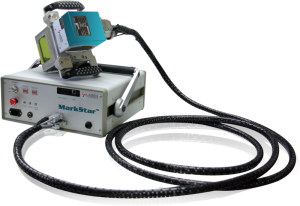 The MarkStar is the industry’s only handheld Fiber Laser Marking System designed for true portability operating off both AC and DC power sources. FiberScanC3 supports remote access data base connectivity designed to operate on Windows 10 (32 bit) and supports Windows XP Professional (32 bit).